Technology has disrupted almost every sector, but has it disrupted education? Dr. Eesa Bastaki, President, University of Dubai, highlighted, in an exclusive interview with Telecom Review, all about how technology has impacted the education sector. Dr. Eesa Bastaki has been a truly influential figure in the technological sector and has pioneered several initiatives and projects that aimed at positioning the UAE as the region’s leading country. Former CEO of ICT Fund, Director of Education, Training and Research and Development for Dubai Silicon Oasis (DSO), Consultant and IT Project Manager for Al-Ain Municipality; and Chairman and Partner of Barajeel Engineering Consultants, are some of the roles he has played in the educational and technological fields. In addition, he is a member of 7 academic boards, Honorary Chair of IEEE, Chairman of Emirates Science Club, Board member of the Cultural and Scientific Association, Board member of KHDA’s UQAIB, Board member of Ankabut (UAE’s NREN) and many more. The President of the University of Dubai recently participated in the 11th Telecom Review Leaders’ Summit which was held on December 10-11, 2018 at the Meydan Hotel, Dubai. 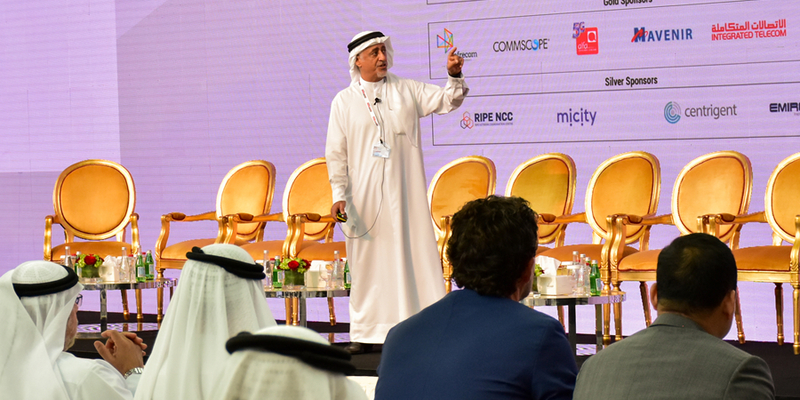 Dr. Bastaki delivered the official opening keynote in which he highlighted the history of technology in education and how it evolved in the UAE. In his keynote, he highlighted the need for techno-edutainment to be introduced into learning in an effort to better stimulate students. He also said that Silicon Valley was a perfect example of a tech hub that aligned itself with academic institutions to drive change. In addition to your role as the President of the University of Dubai, you have an impressive background in the technological field. Can you tell us more about your previous roles as a technology advocate? I have been involved in technology since university. I always loved technology that’s the reason I studied telecommunication engineering until I finished my PhD. When I go to any conference I am invited to, I always talk about future technologies and what’s coming in the next five to twenty years. Technology is an ongoing trend. So, we have to make sure that whatever we do today goes hand in hand with technological development in the world, otherwise, we will stay behind, and the UAE is not here to stay behind. UAE leaders want us to be number one in everything in the world. That’s why, we see today in the UAE and especially in Dubai, all kinds of initiatives and endeavors aiming to achieve the vision of becoming number one. Technology is very dear to my heart. I was one of the founders of Dubai Silicon Oasis, we were working on technology, chip design and manufacturing, and even education in technology. Then, I was the CEO of ICT fund. The main idea behind this fund is to grow the technology awareness, application, design, and implementation in the country in all senses. The fund gives scholarships to universities, for communication and IT, they build labs for electrical engineering department and they support research and business development, research centers, technological incubation centers, in addition to so many national projects like smart education and smart government. All of these are part of the ICT Fund. I was the first employee at the ICT Fund and I was a CEO there. Then, I moved to University of Dubai. The University didn’t have engineering, it just had IT. So, last year we launched telecommunications engineering mainly to drive that momentum of telecommunication and IT in Dubai and in UAE and we are trying to make sure that we are the first in the world. This is the reason why we have signed many R&D agreements with entities in Dubai like Dubai Electronic Security Center. We also have a research center in the University of Dubai like Mohammed bin Rashid space center. Being involved in the educational and technological field, in your opinion how has technology disrupted education? Technology has not yet disrupted education, but it will soon. In less than five years, there will be technologies that will help a student learn from wherever he or she is, in whatever situation he or she is, and from any sector of the world. This means I could be in a driverless car and I could learn, from any profession in the world directly connected as long as I meet some requirements. What are the requirements? Any student who graduated from university has to fulfill course learning outcomes plus program learning outcomes. If they fulfill these requirements, they can get the degree, and they do it in four years. If I am learning anywhere, in any situation, anytime, from any instructor who is ready to teach, at the end, I will fulfill my learning objectives in the program or course. This means that the semester can finish in one month so I can finish a four-year degree in one year and even less. Not only that, even in schools, you can finish in nine years instead to twelve years because you’re constantly learning. It makes the student love to learn, I call it L2L. Once you embed that kind of culture in student, you have met your objective that is for him or her to learn. So, the disruption comes in when you can get the degree in a very reduced period of time. A fifteen -year old student will be able to have a degree in electrical engineering, in business administration, in law, etc. This is disruption. The student is not yet a grown up, but he is mature enough to learn and just needed training to become one of others at work. The disruption is in the fact that time is irrelevant anymore. The curriculum is also adaptive and will change every day. In your opinion, will it be easy to change educational curricula? What are benefits will this change bring? We can do that as long as the ministry puts in place the right policies. Once we’re be adaptive, we’ll get used to being adaptive so, we’ll know exactly when to change and how to change. In addition, we can use artificial intelligence, cognitive intelligence, robotics, virtual reality, augmented reality. We could also use blockchain. If I learn from a professor from anywhere in the world, automatically I could pay that person through blockchain. Internet of things can also play an incredible role. I could call my home and tell one of the devices “please teach me as I am driving”. IoT will allow learning 24 hours a day. This will make sure that we can get degrees in a much reduced period of time. This I what the disruption is all about. Until we reach this point, how can education and universities in particular contribute to digital transformation today? Research comes from universities most of the time, so we need to have research centers that meet the requirements of the future industry. I will teach our students future technology not technologies that have been invented or have been implemented, I have to teach them the future. Then, the students and the researchers will implement that. Every research in the world comes from universities, but they do research for five to ten years. When I present the paper or publish it in one of the journals, they won’t implement it before 3 or 5 years. I need it to be implemented now, and university will be a main thing. So university should have all the kinds of degrees in technology and in addition to all other majors. In your opinion, do universities need to introduce new majors that focus more on achieving the technological goals in the future? Of course, there are a lot of majors that will be introduced in the future because many majors that universities offer today will lose their relevance in the years to come. Robots and AI will take care of many tasks that needed certain degrees to be executed. Therefore, universities should try to introduce new majors allowing students to develop the new technologies and not just implement them. Programing and AI will be more powerful, and security will be one of the most important jobs in the world because everything requires security. For example, treating a person from any disease will be so much easier with NEMS (Nanoelectromechanical systems). A small capsule enters the body and can do so many things and it’s all connected wirelessly. If a hacker hacks this capsule, it could either kill the person or worsen the disease. Security is highly important, that’s why there’s a new thing coming called Cognitive Early Warning Predictive Systems (CWEPS). It is an early prediction tool that gives machines the same vaccination given to bodies. That machine will be immune to any hacking. Thus, we will have services such as vaccination-as-a-service in the cloud. Therefore, security will be one of the main pillars along with programming, coding and AI where robotics will have a great role. What is the main obstacle that is currently hampering technological progress in education? The only thing that’s stopping the progress of technologies in education are the policies and laws. We need to have flexible laws policies that will help universities to progress. I can’t get a one-year degree instead of four years until the ministry says you can. So, policymakers need to changes the policies, laws, and rules. Once they do, then I think we can accelerate progress and go towards the future.